The most attractive lamp ever created? Really? That’s a bold statement. 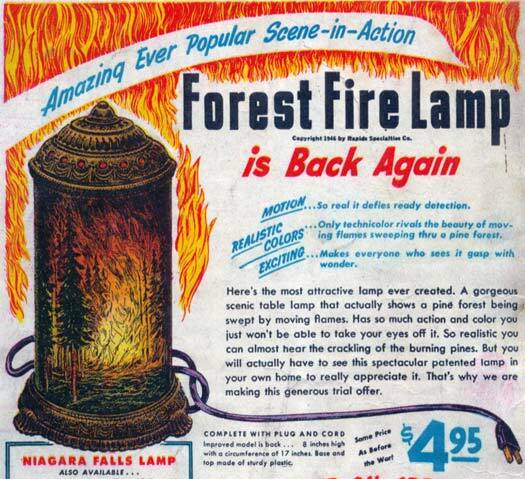 See that mention about Niagara Falls lamp? My family inherited one from my great-grandfather when he died. The operating principle of the lamp is actually pretty cool, when it comes to primitive tech; there’s a 40 watt lamp inside with a metal spike going up, then there’s a transparent plastic cylinder with diagonal wavy pattern. The cylinder’s top has air vents, and there’s a tiny niche in the middle where the spike goes on inside. The outer layer has a semi-solid print plastic cylinder; the areas which are supposed to be “animated” are more transparent than the other areas of the lamp. So, when you turn on the lamp, it begins to warm up the air which escapes through the vents on top and puts the inner cylinder into rotation. At the same time the light shines through the semitransparent areas, and the wavy pattern “animates” fire/water. If you remove the outer cylinder and let the wavy cylinder just spin on its own, the effect is pretty spooky ’cause it makes the shadows of the room very much alive. “only technicolor rivals the beauty of moving flames sweeping thru a pine forest”…. And remember folks The “improved model is back….” with the “Base and top made of (that) sturdy” modern, space-age material… “plastic”.